This year, he has a locker and much use a combination lock to keep his things safe... well, those combination locks that the school issues are NOT all that easy. Even thought we practiced a few times during "Meet the teacher" night last week, my son struggled to get the lock open today. Finally, towards the end of the day, he apparently got it open, but just in time to hear the bell and get back to class. Instead of placing the lock back on the locker, he took it to class with him.. I don't blame the poor kiddo... if it took that long to open - why bother locking back up until the end of the day, right?? Other than that, he had a very successful first day of middle school & if that is the worst thing that happens all year, then I will consider us blessed!!! Thank you for all of your hard work, dedication, love and funny antics!!! Save the poster, print and hang it up in your classrooms or staff rooms!! 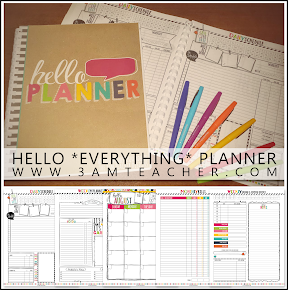 Because I am making this available online, I included my blog address; however, I added it in such a way that you can cut off the bottom portion when you hang it in your classroom (if you choose to). If you do print it and save it, I would LOVE to see your pictures!!! Click the link to download this poster from my Teachers Pay Teachers Shop!! Your poor son! We didn't have lockers, so I can only imagine how frustrating they are at that age... Thanks for the poster! It is going to look great in my room! I teach sixth grade, so don't worry about the lockers! My daughter had trouble with her lock for AGES! TThey all figure it out in the end. 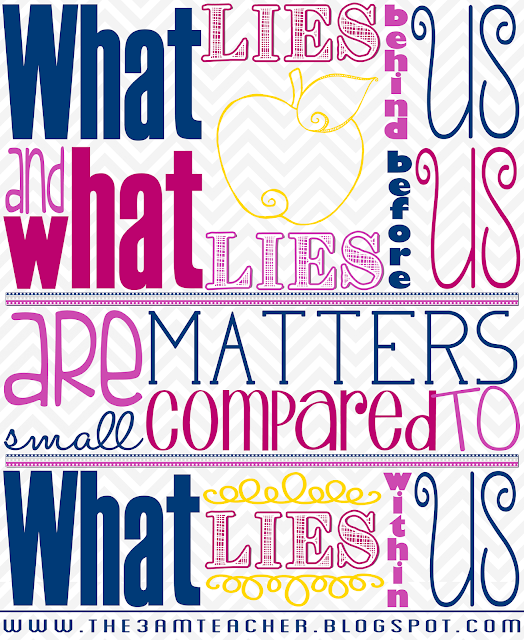 Thanks for the freebie poster, that is one of my admins favourite quotes and you made it in "her" colours. I plan to print it and frame it for her for the first day of school. Maybe she'll be nice to me this year! Here's to wishful thinking! Thank you so much!! I am really loving those colors right now!! Poor baby, the first day of middle school can be crazy for them. I would have had a hard time keeping a straight face also;something similar has happened to most of us. Thank you so much for the poster; I absolutely love the quote. Lockers are crazy! We went through that last year with my daughter. Thank you for the poster! You are very welcome!!! I am sure my son will get the hang of it soon!! Hi there! I know exactly how your son feels. I had the biggest problem remembering which locker was mine and what my combination was that I sometimes still have dreams about not being able to get into my locker and being late to class! Hopefully tomorrow will be better for him! I am a new blogger and am looking for ways to get my blog out there and learn from you guys! Please follow me! In time you will get followers, trust me, it does not happen over night. I can promise you that the journey will be a lot of fun!! I am heading over to check out your blog!! The poster is BeAuTiFuL! Thanks. I just know that he's going to have a great year in 6th, locker and all. It's such a pivotal year for kids. He's a blessed little boy to have you to laugh (and cry) with him! Every year, I feel so bad for the poor 6th graders who panic when they can't get their lockers open immediately. They get so flustered and run to us for help, hoping we'll stick in our keys and open them. I always tell them to TAKE A DEEP BREATH and try it one more time while I watch. They almost always get it when they slow down. I assume his teachers are equally as understanding... maybe he should be reminded that no one will mark him tardy (a great source of stress for 6th graders) during the first week while everyone's still figuring it all out!